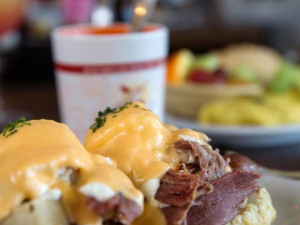 New Orleans is widely known for its gastrointestinal-tantalizing masterpieces. Crawfish beignets, king cake milkshakes, and even the french fry po-boy—we love you so much. In a fried seafood-loving city, however, one can’t help but wonder: What does the healthier world of NOLA eating have to offer? 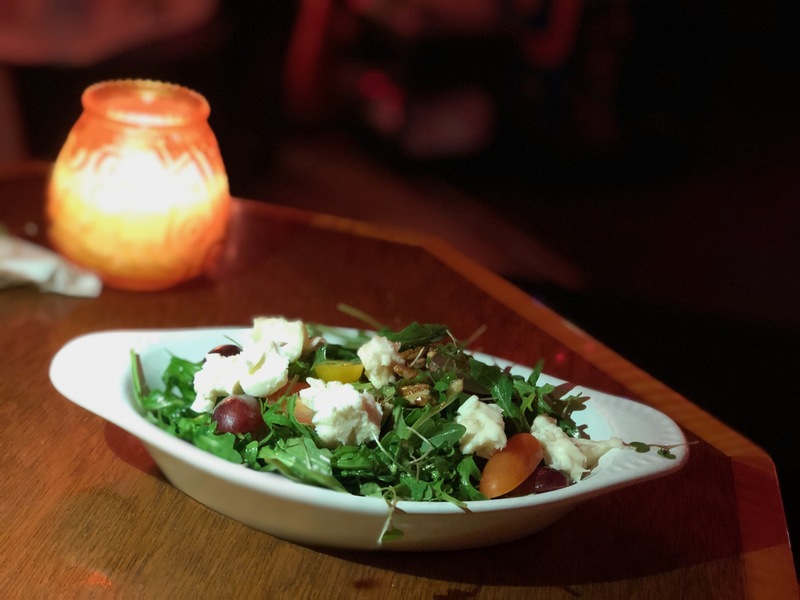 Can a salad really hold a carrot to a classic New Orleans indulgence like shrimp and grits? I spent the last month combing New Orleans restaurants for vegetable-hardy gems, and trust me, if you’re a vegetarian, you’re hardly in a pickle in this city. Vegetable-lovers, rejoice: This spring, it’s time to let those colorful veggies take center stage. These NOLA restaurants are making veggie dishes so good that you won’t even notice the animal carcass missing from your plate. Best of all, you don’t have to break the bank to indulge your rabbit-diet cravings. We’re going to countdown the top 20 veggie-friendly entrees that the Crescent City has to offer. All hail King of New Orleans vegetable dining, the Daily Beet. The Daily Beet’s menu is the spring garden of your dreams, configured into a variety of salads, juices, and toasts. Their most popular bowl, the Rainbow Bowl, lives up to its name. 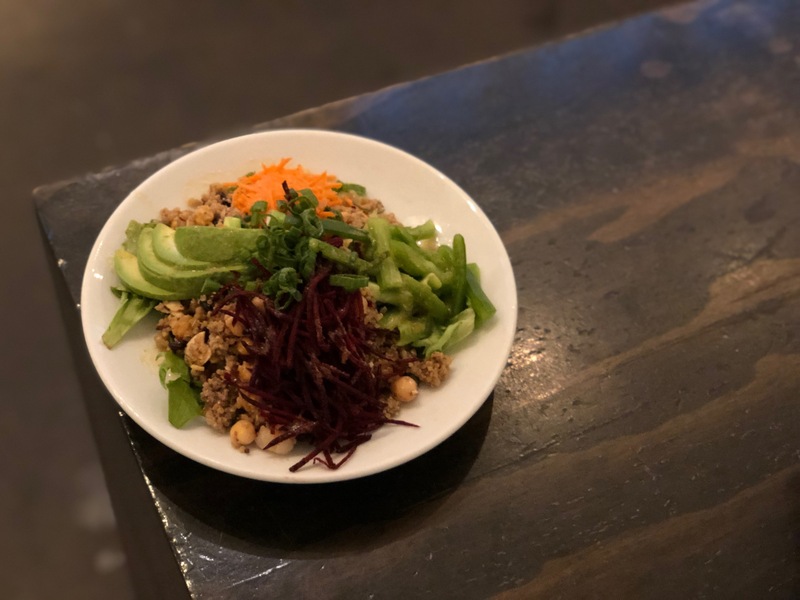 For $10, you’ll find yourself with a massive bowl of quinoa, avocado, carrots, beets, bell peppers, scallions, chickpeas, currants, and toasted almonds, tossed in a zesty ginger-garlic dressing. WHEW! Try saying that five times fast. Vegetable freaks, this place may just be your heaven. 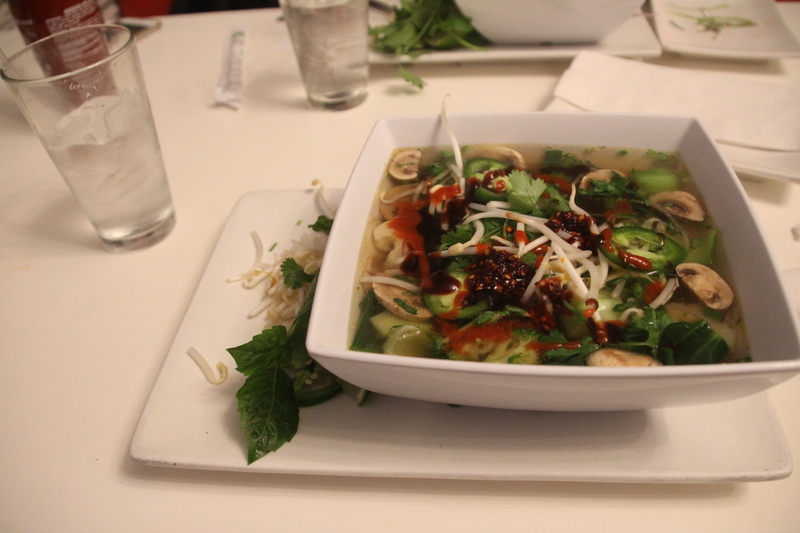 If you’re looking for a hot bowl of phở to warm up, Namese in Mid-City is the place to get it. They’re known for their “shaken phở,” which uses a beef bone marrow broth and a wok-seared protein, but the vegan option is just as delicious. It features fresh bok choy, cauliflower, broccoli, carrots, onions, and mushrooms. Namese prides themselves on their phở having more flavor than what you’ll typically find. Killer PoBoys advertises both veggie and vegan options, which piqued my interest, considering that’s a rarity for a po-boy spot. 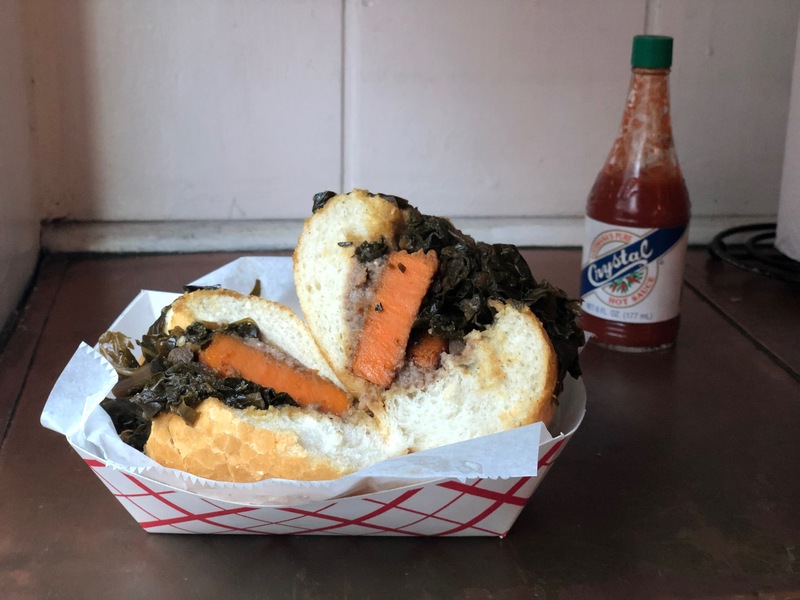 The French bread was perfectly fresh, and it was slathered with a hefty black-eyed pea and pecan spread that contrasted the sweet braised greens and sweet potato. The meaty yet meatless sandwich offered delicious, Thanksgiving-like flavors. Be sure to grab some Zapp’s and a root beer on the side. It’s worth noting that the service at Killer PoBoys is fantastic and kind. My po-boy came out quickly, and they checked back in to make sure I was happy with my choice. It made visiting the restaurant very comfortable. While I ate, I read through the multiple stellar reviews the restaurant proudly has on display. They’re well-earned. Owner Maxwell Eaton started the restaurant to “stick up for vegetarians,” and he does exactly that with his new spring menu. 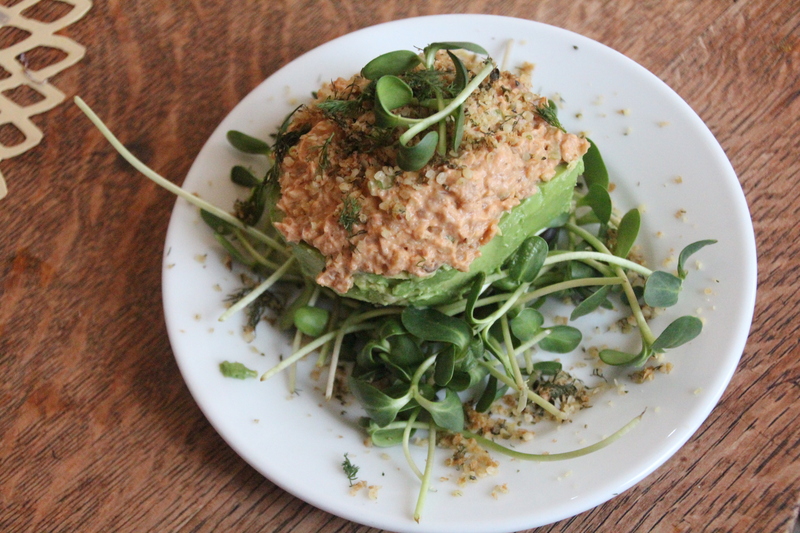 The stuffed avocado instantly gives you NOLA vibes with its vegan cashew chickpea remoulade. MaxWell has expanded its menu this year to include more global influences. Eaton explained that as a vegetarian himself, he knows that vegetarians often have to look to non-American cultures and cuisines when dining out. He describes his new food endeavors as “familiar territory.” Whether you’re on your home turf when dining vegan or if vegetables are completely Greek to you, MaxWell will impress you with a variety of flavors in creative dishes. Bennachin brings tasty West African fare to the French Quarter. The back of the menu notes that the language on the menu comes from the Bassa people of Cameroon and the Mandinka people of Gambia. Although only six dishes are listed underneath the vegetable section of the menu, vegans need not worry, because every entrée can be made without meat, and not a single dish on the menu contains dairy. The table next to me spent 15 minutes arguing over what appetizers to split just because everything looks so good. 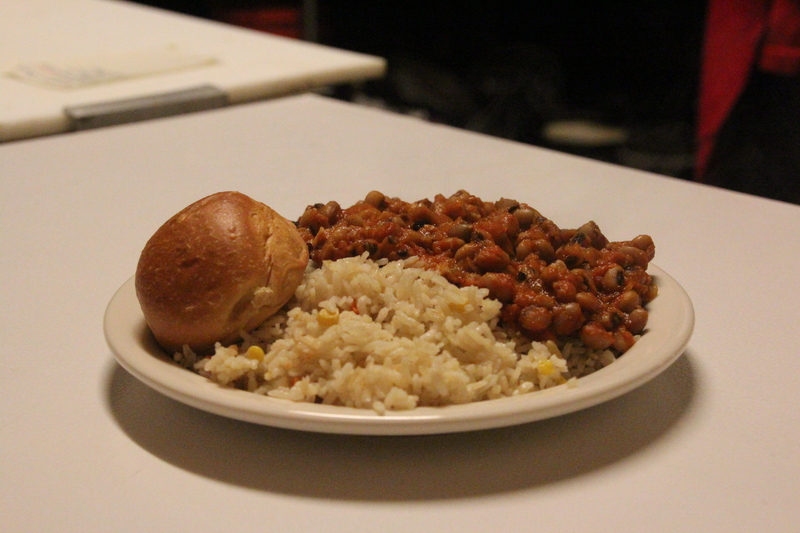 Try the Kone ni Makondo, a black-eyed pea, onion, and tomato stew. 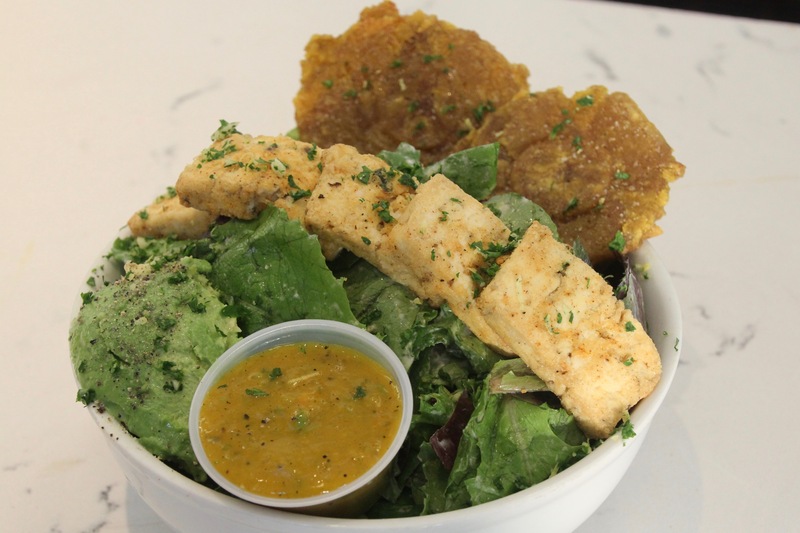 This fresh bowl blends yin and yang by mixing deliciously light greens tossed in coco-lime dressing with sinfully deep-fried and salted green plantains and mushroom tofu. The mango dip provides the perfect antidote to the salty treats that top the salad. It’s large, but you will gobble down the entire thing. All of the vegetables at Atchafalaya are locally sourced, resulting in a menu glowing with fresh veggie gems. While the traditional vegetarian won’t find much on the menu, they only need one egg-cellent entrée: the vegetable scramble. The chef rotates the veggies (mine included Brussels sprouts and leeks), but always tops it off with plenty of Parmesan and hollandaise sauce. 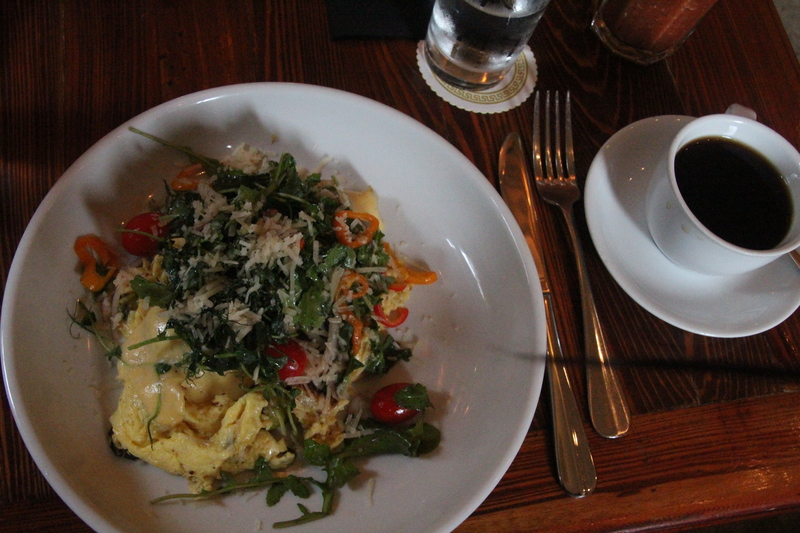 It’ll have you scrambling for more. While you’re there, try out the fabulous make-your-own Bloody Mary bar. The cornmeal patties are tasty and hefty enough to satisfy any sad celiac’s bread craving. However, the real star is the colorful vegetable mélange. 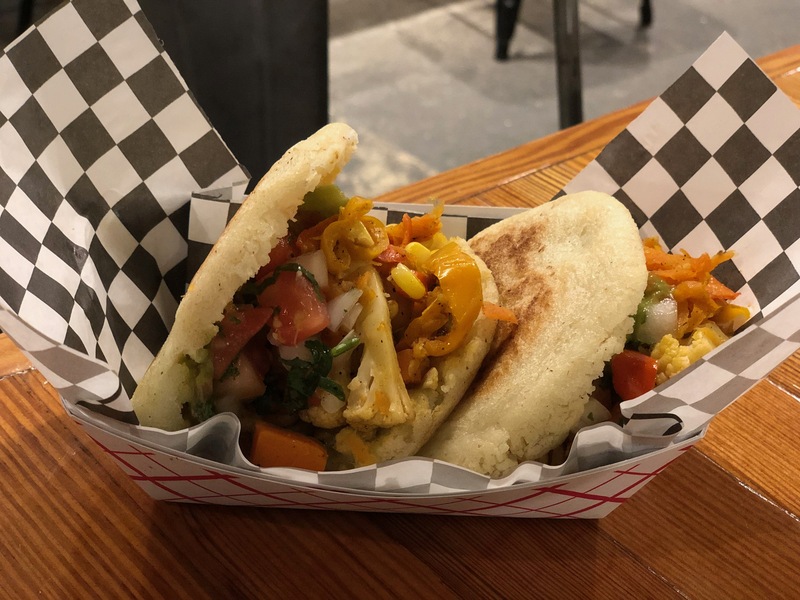 The arepas are bursting with roasted cauliflower, corn, and carrot sofrito topped with Guasacasa (a Venezuelan version of guacamole), salsa verde, and pico de gallo. The best part is that when you finish one arepa, there’s another arepa to polish off—two for $10, and so very worth it. If you’re driving down Canal Street, you may miss Good Karma Café. The hidden gem of a veggie-only restaurant lies tucked in the back of Swan River Yoga. The entire menu is plant-based and delicious, and I could have hung out in the café’s relaxing atmosphere all day long. 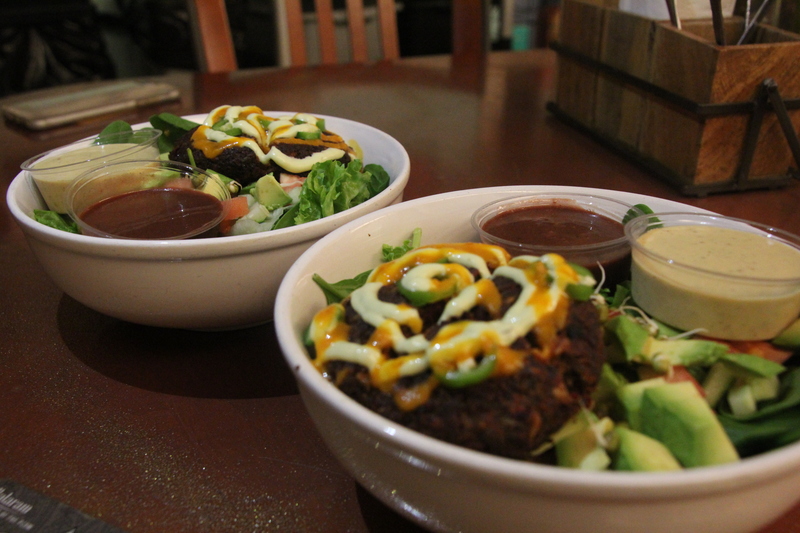 When I asked around about a favorite dish on the menu, the answer was unanimous: the fire burger on a Brahma salad. The house-made veggie burger is spicy and sits atop a bed of greens with sprouted mung, tomato, avocado, creamy almond dressing, and balsamic vinaigrette. You’ll have a hard time deciding which tapas to choose at this Marigny hotspot. The menu is broken down into vegetarian and carnivorous or a “trust-me tapa” for guests who can’t make up their minds among all the enticing options. Opt for the sweet potato leek empanadas, the local greens with bleu cheese, or maybe just the entire menu. Play a game of pool and drink a beer while you wait for tasty tapa after tasty tapa to come out. Click here for New Orleans’s Top 20 Spring Veggie Dishes Part 2: Dishes #10-1!